Solar energy is getting cost competitive and scalable, Solar has so far emerged as the most preferred of renewable technology on offer primary because of the availability of abundant sunlight across the country. All telecom operators as well as tower companies in India have started installing and experimenting with various alternative power solutions. 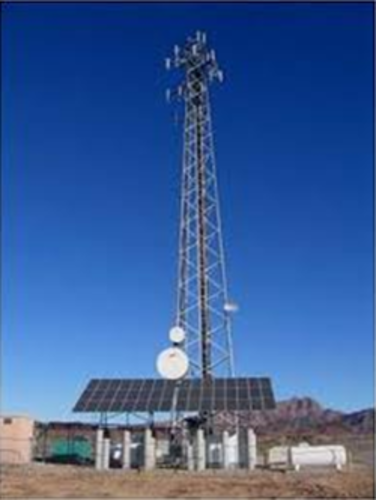 Moreover the operator also approached SPV module manufacturers for powering cell sites using Solar Power. Bharti Infratel has already installed 500 Solar sites on ground and is planning to take this to 2,000 soon. India is presently one of the largest telecom markets in the world, second only to China, with 250,000 mobile phone towers serving over 670 million subscribers. Factor in the country’s advancing Solar photovoltaic (PV) initiative, the National Solar Mission, the fact that power and fuel expenditures account for 35% of the operating cost of each mobile phone tower and one can easily deduce that solar PV and telecom should develop a more symbiotic working relationship. Such a relationship would result in a better overall telecom business model, especially since both factors (PV and telecom) are key elements in India's future growth and role as a global innovator. We Strongly believe, Operations and maintenance are essential within telecommunications to ensure that the service runs smoothly and is prepared should there be any failures, means complete satisfaction for our client. Vishesh Global Projects, We provide total range of services from end to end through performance and commitment. Vishesh Global team believes that we offer the best services for operation and maintenance and even all Telecom projects nationally and internationally, Vishesh Global’s team soon introducing worldwide with their best committed services with providing all telecom solutions internationally. We have come from a long way in very short period of time from our positive and visionary beginning and we believe that forefront of any successful company has to be its professional team, who they are expert in Planning, Execution and management to fulfill the expectation of our each client. The primary objective to offer telecom operators a host of telecom services is ranging from RF Engineering, Site Implementation, Maintenance of networks and Telecom manpower Sourcing. VISHESH GLOBAL PROJECTS brings together best of breed technologies in the telecom and enterprise domains to address clients’ critical business needs. VISHESH GLOBAL PROJECTS has a group of expert professionals who specialize in the execution of contracts and have the ability to respond to the most demanding challenges.